Keep your produce fresher for longer with these tips on how to keep vegetables fresh. The goal of keeping fruit and vegetables fresh is to preserve vitamins, flavour and crispness. The best food storage methods slow deterioration and preserve freshness. Keeping fruit and vegetables fresh as long as possible ensures that when you eat them they are of the best quality possible. To get the best value for money and the highest nutrition, check the following guide on storing vegetables and fruit. Store only high quality produce. The potential storage life of fruit and vegetables is affected by any damage they’ve sustained during harvesting and transporting. Bruises and damage leave produce more susceptible to rot. Handle even harder vegetables gently, as although bruises may not be visible produce can still sustain damage. Store produce at lower temperatures. This is the most effective way to slow the ageing process of fruit and vegetables. As a general rule, the more mature the fruit or vegetable the better its shelf life. Slow growing vegetables such as marrow and pumpkin keep longer, whereas fast-growing plants like broccoli, mushrooms and salad greens rot faster. The water content of fruits and vegetables is high, so even small percentages of moisture loss can result in limp and unappealing produce. Produce should be inspected regularly for rot or pests, and affected fruits and vegetables removed before the damage spreads. 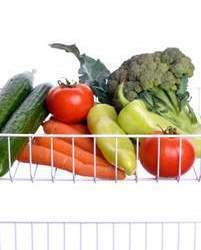 Fresh vegetable storage space should be cool, dry and free of pests. Here are some quick and useful refrigeration tips that will help you preserve flavour and crispness when storing fresh vegetables and fruit. This handy table lists fresh vegetable storage times and gives you some specific tips on storing fresh vegetables. Home remedies for fruit flies really are effective and work quickly. Enjoy the satisfaction as you watch these annoying little pests collect in your homemade fruit fly trap. Ethylene is an agent in the fruit ripening process. Find out which fruits produce ethylene and which others are sensitive to it. After harvesting, the chemical reactions in fruits and vegetables continue. Learn more about the ageing process in fruit and vegetables. Sometimes your vegetable gardening is so successful that you are faced with the question of how to keep vegetables fresh when you have a ridiculous glut of produce. This often happens with tomatoes! When you can't possibly keep all your produce fresh long enough to eat it, other options for preserving fruit and vegetables include dehydration and canning. Debney, H.G. (1980). Handling and Storage Practices for Fresh Fruit and Vegetables: Product Manual. South Yarra, Vic. :Australian United Fresh Fruit and Vegetable Association. Tomkins, B. (1995). Agriculture Notes: Storage Life of Vegetables [online]. Knoxfield: Victorian Department of Primary Industries. Woolworths Ltd (1993). Fresh Food Cooking: The Healthy Way with Vegetables and Fruit. Epping, N.S.W. : R & R Publishing.